Get online payments from your attendees through credit and debit cards with the PayPal Pro payment gateway. Need to Buy a Support License for Event Espresso 4 (includes PayPal Pro)? No installation is required. 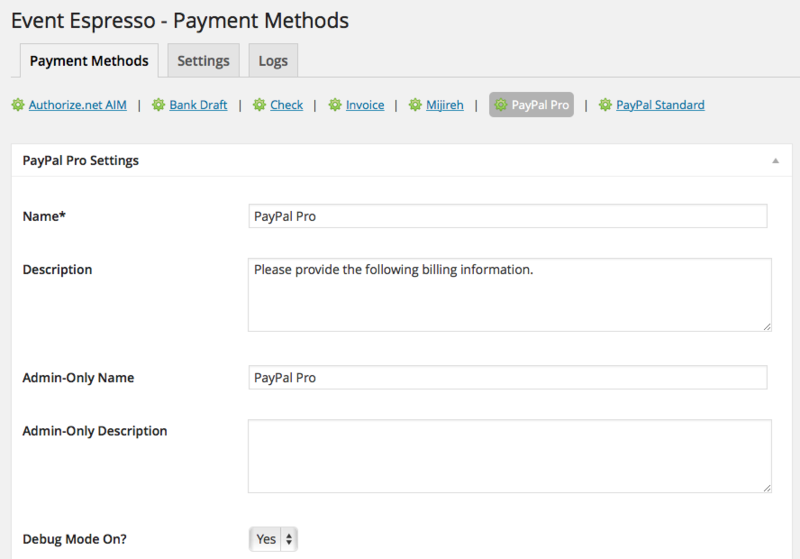 The PayPal Pro payment gateway is included with the Event Espresso 4 core plugin. Your credentials for PayPal Pro can be found in your PayPal.com account. A business account is required and your account should already be approved for production (accepting live payments). 1) Log in to your PayPal.com account. 2) Look for the person icon in the top left area of your screen and click on it. Then click on Profile and Settings. 3) Look at the left area of the screen under My Profile and click on My selling tools. Then click on the Update link for API Access. 4) Click on the option for Classic (NVP/SOAP) which appears near the end of the page. If you have used PayPal Pro for other projects, then you’ll have existing credentials that you can click to view and then copy into Event Espresso and save changes. If this is a new account, then you can request the credentials. Continue with the steps below. 5) Click Request API Credentials. 6) Click Request API signature. 7) Click Agree and Submit. You can then copy and paste the API username, password, and signature into the payment methods page for Event Espresso within your WP dashboard and then click on the Update Settings button. Need to test PayPal Pro before using live (production) mode? You’ll need a separate set of credentials for the PayPal Sandbox which can be used for testing out PayPal Pro. Will PayPal Pro be the only payment method enabled or the only one you offer? Click here to learn how to make it selected by default during the registration checkout. An account with PayPal is needed to accept payments via PayPal Pro. Need an account? Call this number to get started: 1-855-456-1338. Log in to your WP-admin (WP Dashboard) and go to Event Espresso –> General Settings –> Payment Methods. Once on the Payment Methods screen, click on PayPal Pro and click on the button to activate the payment method. PayPal API Username – This credential is needed to process payments and can be found in your PayPal.com account. PayPal API Password – This credential is needed to process payments and can be found in your PayPal.com account. PayPal API Signature – This credential is needed to process payments and can be found in your PayPal.com account. Card Types Supported – Specify the cards that can be used during registration checkout. The PayPal Pro payment gateway will let you accept payments via major credit or debit cards such as MasterCard, American Express, Discover, and VISA. An account with PayPal is needed to accept payments via PayPal Pro, and an SSL certificate is recommended for securing your website. Need to accept American Express with PayPal Pro? This requires you to agree to a separate billing agreement. If you are not sure, then please check with PayPal support to confirm. I configured PayPal Pro and payments are not being processed. Can you help? I see a security header not valid error. What does this mean? When I refund a payment, does it also refund through PayPal Pro? How can I set up a recurring payment or subscription through PayPal Pro? Recurring or subscription payments are not currently supported in the PayPal Pro payment gateway. Is an SSL certificate needed for PayPal Pro?